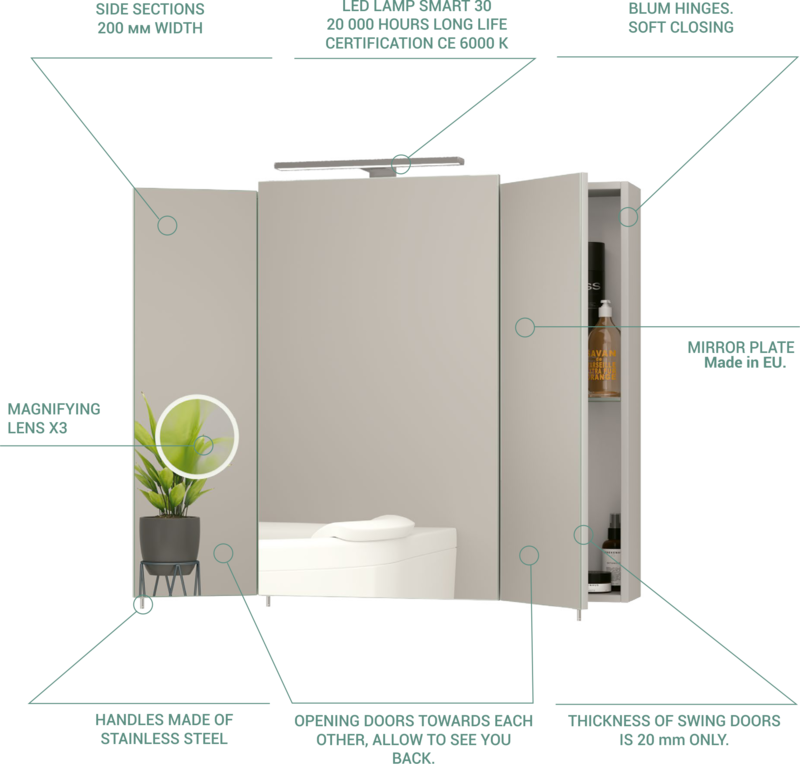 Advantages of Everest Mirror Cabinet for Bathroom. Modern Design. Everest Thin Mirror Cabinet. Everest Mirror Cabinet for bathroom is made of the modern materials, stainless steel handles, imported mirror sheets. This collection features the side facades (measuring 1000 mm and 800 mm) that open towards one another (the three-paneled mirror principle); this enables the side and back views. A magnifying X3 lens may be integrated in the left side part. This is very comfortable for shaving and applying make-up. Cabinet body color: light grey aluminum. The minimal thickness of Everest Mirror Cabinet construction is 144 mm only, which reduces the risk of hitting the user’s head during the washing. 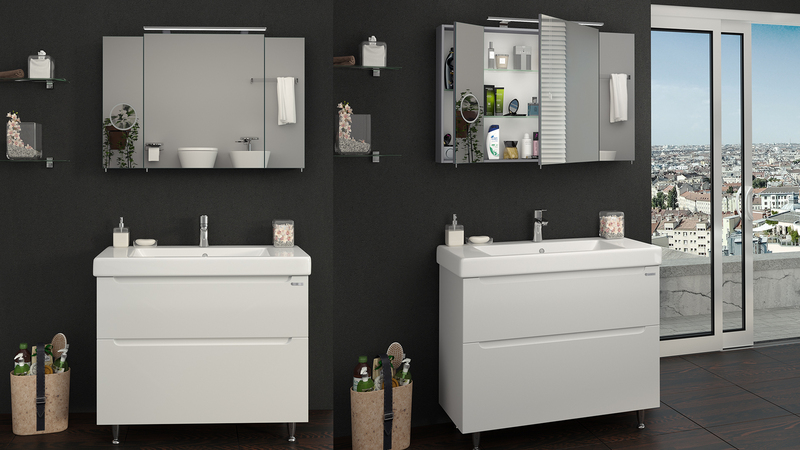 The Mirror Cabinet was designed with due regard for comfortable everyday use. Upon the customer request, the Mirror Cabinet may be completed with 30 cm and 60 cm Smart LED lights and the controls with an additional electric socket. 2 glass shelves are located in the central part of the Cabinet. There is 1 shelf in the side parts. The soft close Blum hinges enable effortless use of furniture for years. Width: 600 mm (1 segment), 800 mm (3 segments), 1000 mm (3 segments). Height of the Mirror Cabinet: 650 mm in the central part, 635 mm in the side parts.